Stealth doesn’t have to be dark and gritty. At its core, it’s more about cunning than slitting throats. Somehow, across Nintendo’s long and varied history as a video game powerhouse, it’s largely stayed clear of stealth. Trying not to be seen seems counterintuitive to the bold, colorful adventures for which the company has come to be known. Now, with Captain Toad: Treasure Tracker, the house of Mario finally stakes a claim in the more nuanced world of covert ops without sacrificing any of its family-friendly appeal. Other toadstools have joined Mario on his adventures in the past, running and jumping with the Mushroom Kingdom’s best and brightest. Captain Toad, on the other hand, is weighed down by a burdensome backpack full of plundered treasures. As a result, our hero’s pace is slowed down to an energetic waddle and any jumping abilities the Captain might have are rendered nonexistent. The courageous mushroom must instead move methodically around enemies and obstacles. By necessity, then, a major focus of the game is on not getting caught. Players will, more often than not, need to take a moment to look around, recognize patterns in the environment and in their enemies’ movements, devising a plan to get through unscathed. This might involve hiding around a corner until a patrolling Shy Guy has passed, faking out a piranha plant so that its fireball clears your path, or manipulating platforms to keep enemies away. Even Captain Toad’s headlamp can be used strategically to make out details in the dark, but it also runs the risk of alerting nearby foes. Every moment feels like a well-choreographed dance playing out, step by step, toward the goal. It’s not all sneaking. Some stages force players to run as fast as they can, looking ahead, thinking on their feet, and committing to a plan. However, this only reinforces the consideration that sets the captain apart from Nintendo’s other adventurers. While Link and Mario can leap into a conflict ill prepared, step back, and ad-lib a new approach, Captain Toad doesn’t have the same luxury. Improvisation isn’t an option for somebody with such a limited skill set, so every decision must be confident and well-informed. It’s not enough to simply look ahead. Treasure Tracker demands players pore over their surroundings and study the terrain, plotting their moves several steps in advance to ensure survival. All of that careful studying might get tedious in the monotonous grit of a realistic urban sprawl, but Captain Toad is adorable enough to reward close inspection. Even compared to the slick sheen of Mario Kart 8, Treasure Tracker is a lush pleasure to behold. Vibrant colors make it easy to see what’s going on in any given scene and the bubbly animation bringing every character to life makes just idling in place fun to watch. The subtly detailed textures of the Captain’s bandana and even the rust-colored bricks make the fantastic and impossible seem all the more believable and real. Nintendo went so far as to include a dedicated zoom button specifically for enjoying how handsome everything is when players aren’t taking in the entirety of a stage’s puzzles. There’s a lot of charm in Captain Toad: Treasure Tracker. Like its hero, the game is short but full of pluck and surprises. 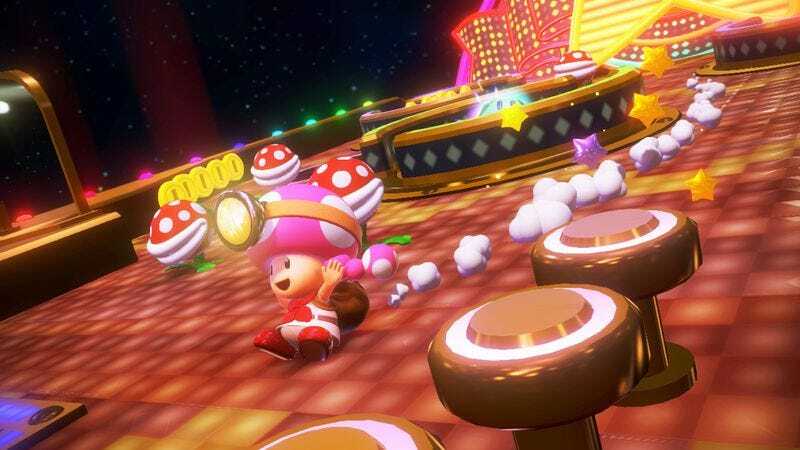 Half of it is played as Toadette, who proves just as capable, only with delightful mushroom pigtails. Stages from Super Mario 3D World are recreated for the Toads to traverse without the benefit of jumping. The most promising surprise, though, is how Nintendo transformed a popular genre that had become all too steeped in darkness and hand-wringing seriousness into a family-friendly affair without losing any of its edge.